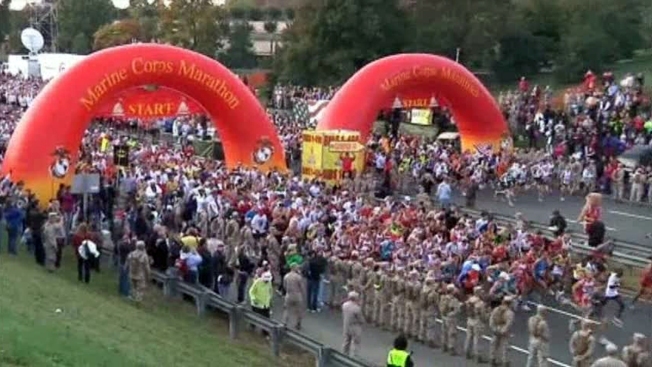 Marine Corps Marathon Lottery Opens Sun. Runners interested in participating in the 39th Marine Corps Marathon will have to enter a lottery. The lottery opens Sunday and will remain open for 21 days. According to the marathon's website, registering for the lottery does not guarantee you a spot in the Oct. 26, 2014 race. Those chosen through the lottery will be notified March 19 via e-mail. But hopefuls who aren't so lucky have some options. Race officials say runners not selected through the lottery can try to join the race through one of the event's charity partners or gain a transfer entry during the summer. All runners must be 14 years old by race day. The 26.2-mile course passes the Washington Monument, Lincoln and Jefferson Memorials as well as the Pentagon.